There is a spectrum of which people with chronic pain can sit upon. Those who are actively trying to manage their pain and continue with their roles and others who struggle to find strategies and slowly lose their roles. People in pain can become aware of the stigma and prejudges that society can label them with. Pain is invisible and is a very personal experience; what may effect one person in one way does not necessarily affect another in the same, which can lead to negative opinions being formed. Fear of pain also plays a vital role in function and engagement in activities of daily living. Fear of pain has been said to be more disabling than the pain itself . Fear of pain can then trigger fear avoidance behaviours, which can then lead into a downward spiral of the ‘Pain Cycle’. People then start to avoid activities and situations where their pain may become irritated or where they feel they may be exposed to negative stigma or comments, such as exercise, social situations, and domestic chores. Take a look at the Pain Cycle by the Peter Moore from the Pain Toolkit. Alongside the Pain Cycle people can find themselves in a boom and bust pattern, where for example; Monday their pain is undercontrol, so they get as much done as they can, but Tuesday their pain is aggravated so they spend the next 2 days resting and recoving. This can lead to a lack of fitness so the next time their pain is undercontrol they can't do as much due to the lack of strength and fitness and their pain is aggravated much sooner and this goes on. Take a look at the explantion in this this video clip. Another essential role the therapist must apply is establishing expectations of the patient. Commonly patients have been to many therapists perviously and had hands on treatments, where treatments were done to them. Re-engagment in activities in patients with persistent pain needs to be self driven with guidance from the therapist, so it is clear to establish this in order to move forward. 'Acceptance has been said to be an important step in sucessful adjustment' . It has also been linked with decreased levels of pain, decrease levels of disability, increased engagement in activity and decreased levels of depression and anxity. Acceptance as mentioned above has been said to be the key to sucessful adjustment. There is currently a lot of work on Acceptance and Commitment Therapy (ACT) being used with people who have persistant pain. In summary this approach looks at the person accepting they have pain and being mindful about what they are experiencing. A person who applies restrictions to the things they value in life such as "I can't do X, Y or Z until I get rid of my pain" is seen as a form of non-acceptance of a sence that is unavoidable. This then inducing the suffering experienced from pain. ACT aims to promote the psychological flexibility and mindfulness of thoughts, feelings and behaviours associated with pain. This is a vital step in the engaement of the patient with persistent pain. It is essential that the Physiotherapist assist the patient to identify their own goals. This may include prompts from what they perviously could do and to help them to identify what activites they value. This involvement in the decision making process can help with the patient's overall satifaction of the service. The assessment of goals can be done through an informal conversation or though a more formal questionaire - which may help to prompt them with what activities they would like to be able to do again. It is important to remember that the patient is the expert in their own pain so empowering them from the beginning is the key. 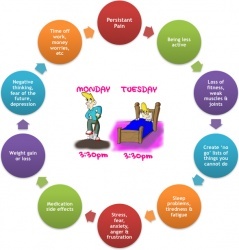 Pacing is a tool that can help address the boom and bust cycle or also known as the over-acitivty and under-activity cycles as discussed above. This is a tool that can be used to re-engage patients back into activity gradually and move them away from this boom and bust cycle. Most activities are driven and paced through the patient's pain levels. They do an activity until they become fatigued or pain restricts them. This strategy aims to empower the patient to drive a set activity through cognitive awareness, but is essential that this tool does not feed into the avoidance of activities . It is important to educate the patient on pacing to engage them and to involve pacing to work towards their goal. If they do not fully understand the process they are likely to either not be interested and not engage in the activity or poorly implement the tool and find it unuseful. Once a patient is engaged in the philosophy of acceptance, goal setting and pacing they can then start to become re-engaged in vocational and functional activities. This is something that is desired to be sustainable. Patient's with persistent pain can become like a 'revolving door' re-entering the health care system to see different professionals to find a cure or someone that can help them. This method is about empowering patients and giving them the tools to manage their symptoms independently and to be able to lead a self valued life. Evidence suggests that self management programmes that run for 8 weeks with a multidisaplinary team including a psychological element has had beneficial results with patients. This may be the case with group programmes to build a spport network for the patients. Support networks can have a positive influence on the journey of the patient with persistent pain, for exchanging ideas and offering positive encouragment and sharing experiences. Strong et al 2012 also highlights that the use of social media can be a method of accessing support networks. Finally it is worth bearing in mind that the patient with a supportive family can have a positive effect, so it may prove useful to have a session with the patient and a family relative to educate them also. Persistent pain is a complex experience that affect each person differently, that can be severly debilitating. It is the duty of a Physiotherapist in this area to understand and appreciate all the factors which may affect each individual's experience of pain through communication and listening to the patient. Only by doing this can the physiotherapist then guide the patient the patient through steps to enable them to re-engage with vocational and functional roles they value.